1. You can analyze the way one or both texts portray a concept, such as love, family, villains/monsters, slavery/servitude, goodness, loyalty, cruelty, happiness, tragedy, heroism, etc. If you choose to use both texts, you will compare how each one of them addresses the concept you’ve selected. Your research might include other scholarship on that issue and/or historical scholarship about the time during which the works were written. 2. You can do a critique of one or both texts from a certain perspective, such as gender, class, race, sexuality, age, etc. If you choose to use both texts, you may want to argue that one text is in your opinion more successful in its representation of women, underprivileged classes, etc. than the other, and explain why you believe that to be the case. Your research might include theoretical works from the perspective you’ve selected (feminist theory, working-class studies, etc.) and/or historical scholarship about the time during which the works were written. 3. 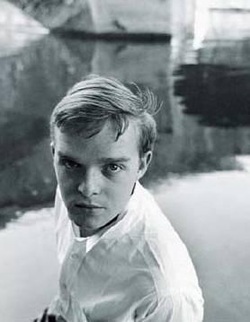 Both works are memoirs (though Capote referred to “Memory” as fiction, he based it on his own experience and wrote it in a tone very similar to a memoir). Truman Capote focuses his memoir on a person who was vital in shaping his identity. Fredrick Douglass focuses his memoir on his own experience and the many people and events that influenced his youth for better or for worse. Is there a person who helped shape you in the way that Buddy’s friend shapes him? If you choose to focus on “Memory,” you would write about that person’s influence in your early life and make connections to the way in which Buddy’s friend influenced him. For research you could look at child psychology or other stories, novels or films in which arguments are made about people’s influence on children. If you choose to focus on Narrative, you would look at a particularly difficult situation you’ve had to overcome and the ways in which you used your mental and/or physical abilities and those who helped and/or hindered you along the way. In which ways does Douglass help you make sense of your own experience? How are they similar or different? For research, you could look at information related to the topic of your own experience, as well as scholarship on slavery and the abolitionist movement. 4. Douglass’s work aims to find support for the abolitionist movement. What kinds of similar debates do we have today? For this option you would choose a current movement and examine the way in which their arguments and rhetoric are similar or different from Douglass’s in Narrative. What could they learn from Douglass? What do they do better than he does? For this option your research would focus on the movement you choose and on Douglass’s reception and effectiveness during his lifetime. You could also look at other more or less successful abolitionists and the ways in which they made their arguments for the end of slavery. Your paper should be double spaced and 5-8 pages long (around 1,500 - 2,400 words). You will need at least three sources. One from the web, one from print (newspapers don’t count as print for our purposes) or the library catalogue, and a third that can be whatever you wish as long as it’s credible. You can have more than three sources but don’t get carried away. No more than eight would be advisable. Your name must be on the assignment and you need to give it a title. Your first draft is due on Monday, September 26. You should have an electronic copy of the paper that you can email to your fellow workshop members. Your final draft is due on Wednesday, September 28. I will return work electronically. Everyone will receive their graded assignments within a week of turning them in, but not all at the same time. I will return them as I grade them, and I will grade them in the order that they reach my inbox at: hidalgoatpurdue@gmail.com.